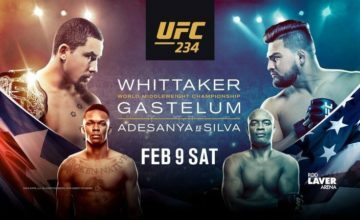 Last night’s UFC 234 main event saw undefeated middleweight prospect Israel Adesanya (16-0) defeat Anderson Silva (34-9-0) via unanimous decision. UFC middleweight champion Robert Whittaker had been expected to face Kelvin Gastelum in the main event, but in a last minute turn of events, Whittaker had to withdraw due to emergency surgery on his bowel and abdomen. The ESPN and ESPN Deportes telecast of UFC 234 Prelims aired from 8-10 p.m. and averaged a 1.0 metered market rating. The telecast followed the Virginia/Duke game and peaked with a 1.7 metered market rating and during the Ishihara vs. Kang bout. In addition to the telecast of the Prelims, ESPN and ESPN+ offered multiplatform coverage of UFC 234 including live press conference, weigh-in, pre- and post shows, Ariel Helwani’s MMA Show and Ariel & the Bad Guy. The telecast followed the Virginia/Duke game and peaked with a 1.7 metered market rating and during the Ishihara vs. Kang fight. The Octagon now travels to Phoenix, AZ’s Talking Stick Resort Arena for the first UFC Fight Night on ESPN for Ngannou vs. Velasquez, Sunday February 17 starting on ESPN+ at 5:30 p.m. ET, followed by TV coverage starting at 7 p.m. on ESPN.